I live in Chicago. Since the closest Japanese market is an hour’s drive away, I normally do my shopping once, or at the most, twice a month. Living in a major US city certainly helps. Every time I go to the market, I spot license plates from Iowa, Ohio and Wisconsin. Families make a road trip out of this basic chore; they enjoy the Japanese atmosphere, have lunch, and go to the Japanese bookstore. 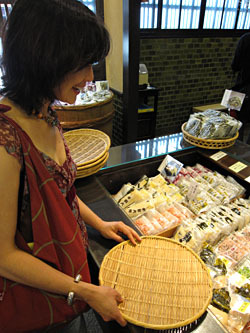 The market is like a little slice of Japan, and I would say that the customers are about 80% Japanese. I feel fortunate to live this close by, but even if I were to move away, shopping would still manageable, because I have a shopping strategy. High on my shopping list are the fresh Japanese vegetables and mushrooms that aren’t as readily available at my local grocery: slender, crisp Japanese cucumbers, Japanese sweet potatoes that have the flavor of chestnuts, eryngii and enoki mushrooms, Japanese eggplant, mitsuba, ohba, etc. I also buy things like natto (which can be frozen) and tofu, of which there is a large selection, including my favorite; a soft and delicate kinugoshi variety that melts in your mouth. My husband invariably buys another package or two of pickles, even though we have more in our fridge than we could possibly eat. And I indulge in sashimi, which we always eat the same day. Various kinds of fish and prepared salads can be frozen – they are shipped from Japan that way – so we bring along a cooler and pick the most solidly frozen packages we can. This way, I have an ample supply of freshly frozen seafood; cut and lightly-salted salmon, filleted saba (mackerel), vacuum-packed prepared unagi (sea eel), etc. In the winter, I also pick up a package or two of oden, which comes frozen and is the perfect antidote to bone-chilling Chicago winters. Then, I restock the dry pantry items, sauces and salad dressings. I find the ready-made salad dressings from Japan particularly tasty, though expensive. And last but not least, we stop by the bakery, where we buy freshly baked thick cut bread, and perhaps a few anpan or perfect pieces of cake. Let’s not forget the snack aisle! Although I don’t eat senbei (rice crackers) very often, my husband has a few types that he simply can’t live without, so we stock up. When he’s working late, he often subsists on packages of senbei! It’s always fun to watch the Western teens who tend to frequent the snack aisle. I often wonder if they’re Otaku (anime/game fanatics). Going to a Japanese grocery for the first time can be a bit confusing. The packages are not always labeled with English translations, and there are soooooo many unfamiliar foods. Refer to the Pantry List for a list of essentials, and the section on ingredients to familiarize yourself before you go. At a tsukemono (pickle) shop in Kyoto. While shopping in Chicago doesn't compare, Japanese markets in the US usually have a decent supply of imported pickles.